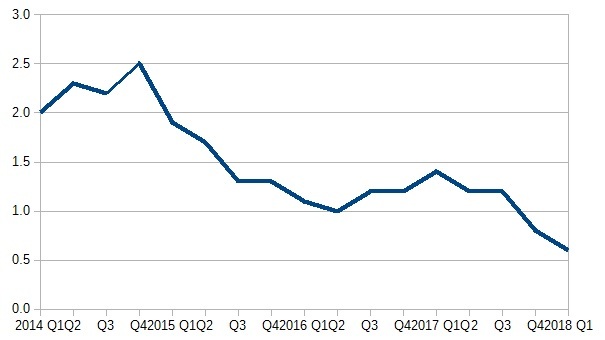 Monetary and fiscal policy makers in the UK seem to think they had a good recession. You can tell that because neither group seem particularly interested in learning any lessons. This is despite the fact that we had the deepest recession since the 1930s, and the slowest recovery for centuries. It is also despite the fact that the level of UK GDP is almost 20% below the level it would be if it had followed pre-recessions trends, and all previous recessions have had the economy catch up with that trend. You can tell from this paragraph that I do think serious changes are required to how monetary and fiscal policy are done. So does the IPPR, and their detailed analysis and proposals are set out in a new report by Alfie Stirling. The analysis is not too technical, well presented, well researched and I agree with a great deal of what is said. I will look a monetary policy first, and then fiscal policy. What the Great Recession showed us (although many macroeconomists already knew) is that once nominal interest rates hit their effective lower bound (ELB) , monetary policy makers lose their reliable means of combating a recession. The report is dubious about Quantitative Easing (QE) for much the same reason that I have been for anything other than a last resort instrument. In brief, the impact of QE is very uncertain because it is not routinely used, and in addition there may be important non-linearities. It is not a reliable alternative to interest rates. I know some macroeconomists will disagree with that assessment, but I think the point is valid. The report also rejects helicopter money as a solution to the ELB problem. Here I found their discussion less convincing, but they do recognise that a form of helicopter money has already been undertaken by some central banks through creating money to change the relationship between borrowing and lending rates, a point that Eric Lonergan has stressed. The two reforms to monetary policy that have been suggested and which the report does support are adopting unemployment or nominal GDP as either a second target or as an intermediate target, and raising the inflation target by one or two percent. I have argued strongly for a dual mandate and also for using nominal GDP as an intermediate target, so I have no objections here. The report recognises, however, that none of their proposed reforms to monetary policy eliminates the ELB problem completely. We have, inevitably, to think about the other reliable and effective instrument that we have to stimulate aggregate demand: fiscal policy. Their proposed fiscal rule is very similar to Labour’s fiscal credibility rule. It includes (a) a ‘knockout’ to switch to fiscal expansion if interest rates reach their ELB, (b) 5 year rolling target for a zero current balance (c) a 5 year rolling target for public investment (d) a similar target for debt to GDP. The last in this list you will not find in Portes and Wren-Lewis, in essence because it involves double counting, and debt targets are less robust to shocks than deficit targets. If governments followed this fiscal rule, then the ELB would not be the serious problem that it is, because reliable fiscal stimulus would replace reliable monetary stimulus at the ELB. But the IPPR worry that governments might not do what the fiscal rule, and with the knockout what the Bank of England, tells them to do. They are concerned that what they call ‘surplus bias’ might be so strong that the government would not run the deficits that the Bank asks them to run. To overcome this concern, they suggest an alternative to QE at the ELB: the Bank should create reserves to fund projects that are part of a National Investment Bank (NIB). The NIB would be independent of government in terms of the projects it funded (but not its high level mandate), and it would normally raise funds in the open market. (This makes it different from proposals that the NIB be entirely funded by the Bank: see here.) In an ELB recession, the Bank of England would ask the NIB to fund additional projects, with the Bank providing the finance. As public investment is particularly effective as a countercyclical tool if undertaken immediately, and as it is usually possible to some degree to bring forward investment projects, this proposal seems a superior alternative to QE, as long as the link between additional purchases of NIB debt and additional investment by the NIB was reasonably clear. The key point here is that although conventional QE might try to stimulate private investment by reducing firm borrowing costs, in a situation where there is chronic lack of demand that can be like trying to push on a string. The same problem should not arise with an NIB. In that sense it just seems like a good idea. Whether it would be enough alone to circumvent the problem of a rabid surplus bias government during a recession I doubt. The kind of public investment that is easy to ramp up quickly in a recession are things like flood defences or filling holes in the road, rather than the kind of things an NIB would fund. A government suffering strong surplus bias could cut these things quicker than an NIB could fund additional projects. Some form of QE would be more powerful in this respect. The danger in either case is that you just encourage the government to try and get down debt even faster: if QE gives money directly to people, the government just raises VAT. How seriously should we worry about (design policy for) a government offsetting everything the Bank is able to do to stimulate demand in a recession? The answer may be given by imagining the following scenario. The government operates a fiscal rule that has an explicit ELB knockout. The Bank of England, when rates hit the ELB, requests the government undertake fiscal stimulus. If Cameron/Osborne had been faced with both those things, would they have still cut back public investment? I suspect the answer is no. That of course by implication means that central bankers in Europe played a large part in facilitating (or encouraging) austerity, which in the UK stemmed from a failure to admit the problems of the ELB because of a naive faith in QE. Which brings us to central bank independence and what I call the conventional assignment (outwith the ELB, monetary policy deals with macroeconomic stabilisation). The IPPR stay with the mainstream macroeconomic consensus in wanting to keep both. People with a more MMT type view, like Richard Murphy, would reverse  the conventional assignment, and have fiscal policy doing the macroeconomic stabilisation. I have written a great deal on the distinction and will not repeat that here. However it is worth making one point on independence. The reasons for making central banks independent are not peculiar to monetary policy. They are that if the complex task of macroeconomic stabilisation is left in the hands of politicians who get secret advice, they can mess things up for political ends. Messing things up can be minor (e.g. delaying necessary measures), structural (e.g. time inconsistency) or explosive (e.g. hyperinflation). Austerity shows that this fear is justified. MMT’s answer to the IPPRs concern about a surplus bias government is that this is just a cost of democracy or the good guys would always be in power, which I suspect many might not find reassuring. Yet that is also why European central bank’s encouragement of austerity was far from helpful to the case for the delegation of macroeconomic stabilisation. 'Effective' because in practice it is up to the central bank to decide at what point they cannot reduce nominal rates further. Not strictly true. In the conventional assignment monetary policy does inflation/aggregate demand and government looks after its debt, while in MMT fiscal does inflation/aggregate demand and government debt looks after itself. I hope time inconsistency can be subsumed under this broad definition. The received wisdom on immigration goes as follows. Growing public concern about increased immigration to the UK led the Coalition government to put in place a target for net migration, and then enact measures to achieve that target. Creating a ‘hostile environment’ to discourage immigration was part of that effort. The Windrush generation and descendants are unfortunate victims of overzealous or box ticking officials. Almost everything in this received wisdom is wrong. Although immigration has never been popular, active concern as reflected in opinion polls increased followed the Conservative party highlighting the issue as a way to attack the then Labour government (Hague: foreign land, Howard: are you thinking what we are thinking), and more importantly an increasing number of articles in the right wing press portraying immigrants or asylum seekers in a negative light. Most people didn't think immigration was a problem locally, but they perceived it was a problem for the country as a whole. The best predictors of immigration concern was readership of the Mail, Express and Sun. In my post about neoliberal overreach, I listed austerity and immigration as the two ways in which the 2010 Coalition government went too far in an effort to achieve neoliberal goals. Austerity was what I call deficit deceit: using scare stories about the deficit to shrink the state. The focus on immigration with the tens of thousands target was also deceit because most of the government had no intention of achieving that target. The hostile environment policy was there for show, as part of the deceit. The 'go home' vans were meant to be seen by the public, not illegal immigrants. Most of the government knew that seriously trying to achieve their immigration target would damage the economy, but rather than tell the public this they continued the facade to take votes off Labour and UKIP. The facade came back to bite the Conservative government during the Brexit referendum. Cameron could not credibly start talking up the benefits of EU freedom of movement while at the same time putting policies in place that made it appear as if he was trying to hit his own immigration target, and then failing to do so. In that sense the Conservative's immigration policy created the Brexit disaster. Part of the facade of trying to hit that target was the hostile environment policy. Some ministers were right to suggest that the policy was “almost reminiscent of Nazi Germany”. To say that the policy only applied to illegal immigrants misses the key point: people were assumed guilty of being illegal until they could prove, and pay to prove, that they had a legitimate right to be here. Being assumed guilty could mean losing your job or your home. If the Home Office made a mistake, the applicant had to pay to try to put it right. If the mistake was large enough, they could be detained without trial. Like austerity, the Conservative party’s focus on immigration seemed like a useful political tactic at the time, as well as playing to the xenophobic elements in the party’s base. Like austerity, the policy started to do real harm to innocent people, yet the leadership showed no inclination to dilute or abandon their policy. While Cameron and Osborne could see that the immigration target was only there for show, they had given the responsibility of achieving it to someone who didn’t get the deceit. Worse still, Theresa May seemed quite happy with any collateral damage as she stubbornly pursued the impossible. So austerity and the hostile environment continue, because the Chancellor and Prime Minister respectively are committed to these policies, and seem indifferent to the consequences until forced to undertake partial palliatives. This is why I called both policies neoliberal overreach. Past Labour leaderships have unfortunately felt they had to tag along with both or suffer electoral costs. Liberal Democrats were part of the government that enacted both. The media helped construct or went along with narratives that made both policies seem essential. But there was a small group of Labour MPs who opposed both policies on principle, and continue to do so. Is it any wonder that it is they who now lead the opposition party? Is it any wonder that the political and media consensus that enacted neoliberal overreach will do anything they can to prevent that group gaining power? The same public opinion that supposedly was clamouring for policies to control immigration. It is sometimes said that most people dislike immigration not immigrants. When confronted (thanks to persistent strong journalism) with the human consequences of anti-immigration policy on actual immigrants, the public pull back. Most of the public lack the ideological zeal and indifference to its human consequences of many of their political leaders. A pluralistic democracy is a democracy with many centres of power. Typically that involves an executive (the government) and parliament, central and local government, an independent judiciary and an independent press. Countries differ in how pluralist they are: the UK has a more permanent civil service than the US but its second house of parliament does not have equal power to the first. Plurality is embodied in conventions as well as institutions. In a two party system the other side is respected as embodying the wishes of part of the population, and there may on occasion be cooperation between politicians on different sides over certain issues. In addition plurality itself is respected: the government does not normally contest the power of parliament and the judiciary, for example. Although there was room for improvement before Brexit (power was pretty centralised), the UK was a pluralist democracy. This post is about how Brexit has begun to threaten that. It began with how the Prime Minister, encouraged by a section of her party and a large section of the press, interpreted the referendum result. The country was almost equally divided. That should have meant that the form of Brexit should have tried to take account of the fact that almost half of those voting wanted to stay in the EU. Instead the Prime Minister chose a form of Brexit that appealed to a clear minority of parliament. Perhaps partly because of this (but I suspect also because of her temperament), Theresa May chose to marginalise parliament as much as she could. She didn’t want it to vote on whether Article 50 should be invoked. That battle went to the supreme court, and she lost. The press that had played such a crucial part in getting a majority for Brexit called the judges ‘enemies of the people’ or similar. If judges had hoped for some defence of an independent judiciary from the government they were disappointed. However the executive did not only aim to take power away from parliament on this one decision. In the bill that transfer EU laws to the UK, various Henry VIII clauses were inserted which gave the executive the power to ignore parliament. The opposition voted against these clauses, and eventually May was forced to retreat when some Conservative MPs rebelled. These rebels have been branded saboteurs on the front pages of the right wing press. As of now it remains the case that MPs will not be given a meaningful vote on the terms of the final Brexit deal: if they vote against the government says it will leave with no deal. The government has also done its best to try and conceal the analysis the civil service has done on different forms of Brexit, and ministers have lied to parliament and the public in the process. The Prime Minister and ministers seem happy to lie to the public about the imaginary Brexit dividend, and the broadcast media fails to question these lies. Ministers appear to have no qualms in calling the leader of the opposition a traitor based of fanciful stories in the right wing press. Is there something inherent in Brexit that has brought about these attacks on pluralistic democracy? To an extent I think there is. Brexit is a fantasy project that will actually do the economy harm, and as I argued here when politicians attempt to conceal the truth from the public they tend to become more authoritarian. As the dreams of some Brexiters fall apart on the rocks of the EU negotiations and the Irish border, no doubt similar attempts will be made to conceal that truth from the public as well. However I think there are two other factors linked to Brexit that have helped this form of populism emerge in the UK. The first is the character of Theresa May herself. She shows a disregard for people that I cannot remember in previous Prime Ministers. The current excesses of the Home Office with respect to immigrants who have lived here for decades is a direct result of her ‘hostile environment’ policy, which she seems happy to continue. She took the decision to ignore the wishes of the 48%, and she also decided to use EU migrants in this country as bargaining chips in the negotiations. The government seems largely indifferent to the increase in attacks on immigrants since the Brexit vote. Her focus seems entirely on keeping her party together, whatever the collateral damage in terms of broken individual lives. The second factor is the right wing press. In other countries we have seen the dangers of the state (or head of government) controlling large parts of the media. The same problem arises with Brexit. At its best the press can expose government failure and corruption, but at its worst it just acts in its owners self-interest. When those interests happen to be aligned with the interest of the government then the press acts as the state's propaganda arm. It has been the right wing’s press that has banged the ‘will of the people’ drum, which is classic populist (as in anti-pluralist) trope. The situation has been made much worse by the BBC’s apparent indifference to negative news about Brexit: its lack of interest in the Cambridge Analytica link to referendum overspending allegations is deeply worrying. Understanding why we have seen attacks against pluralist democracy in the UK helps answer the question of how permanent these threats might be. Parliament is to some extent fighting back at the attempts by the executive to reduce its power. If Brexit is neutralised as an issue, the force behind attacks on pluralistic democracy disappears, unless of course it is replaced by something else. However Theresa May could remain as Prime Minister for a lot longer than people imagined after the election of 2017 . The right wing press will still be with us, with their message amplified by the BBC. The situation in the UK is not as bad as it is in the US, where the entire Republican party seems to have given up on pluralistic democracy, but that is cold comfort for a country that often boasts of its democratic heritage. That includes myself. When I wrote about the Conservative zugswang, I actually underestimated the bind the Conservatives were in. I confidently said “The Conservatives will not fight another election with May as their leader.” That is now less clear. As long as Brexit remains a live issue, which it will do until the end of 2020 at least, the majority of Conservative MPs dare not replace May because the party could elect someone like Rees-Mogg to take her place. Talking to the Establishment is what Aeron Davis, a Professor of Political Communication at Goldsmiths London, has been doing for twenty years. In this little gem of a book he tries to pull together his thoughts and reflections on these interviews and extensive research on how today’s establishment works. When people talk about the Establishment, they often imagine a socially coherent body managing the country in ways that serve its own collective interests. An elite network who predominantly went to certain public schools, who make big decisions of state over dinner in their private clubs. Even if outsiders entered into the upper echelons of politics, the civil service, business or the media, they inevitably became part of the Establishment network. To radicals the Establishment was a brake on social change, but for conservatives it provided the comfort that the country was in sound collective hands. Davis argues that with the advent of neoliberalism in the 1980s, that cosy world began to fall apart. He even speculates that we may now be seeing the end of what we think of as an Establishment. 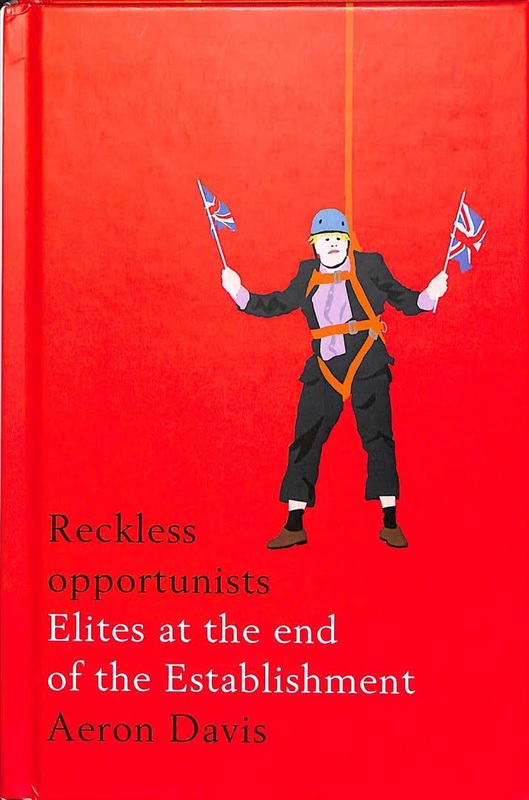 He suggests the elite have lost coherence: that rather than look after the interests of the network as a whole (and for a conservative therefore the country), they look after the interests of themselves. They have become the reckless opportunists of the book’s title, getting what they can from the chaos they helped create. In politics this idea is personified by the man on the front cover, who threw the country into the destructive mess that is Brexit simply for the sake of his own personal ambition. Press barons turned their newspapers into propaganda vehicles for the same end. But he also argues that we can see the same opportunism in business leaders who put personal returns over the interests of the companies they run. He finds that in the civil service the key ingredient for success is how good an individual is at self promotion, and he argues the same applies elsewhere. A lot of this rings true for me, but Davis backs it all up with research and interviews. While austerity was what I call deficit deceit (using the deficit to scare people into accepting a smaller state) which served neoliberal ends, in the UK it was I suspect also simple political opportunism: a way to embarrass the Labour government with little thought about what it might do to the economy. In budget after budget, Osborne seemed more focused on wrong-footing the opposition than doing anything to revive productivity growth. You could easily call that reckless opportunism. As well as this overriding theme, there is acute observation on other matters as well. For example on how journalism has become churnalism, and the accompanying growth of the PR industry. The only time I have met Aeron was at a conference where I was talking about how the media had distorted the austerity debate, and I remember how taken aback I was when some in the audience suggested academics just needed better PR. But this also connects with the main theme, where self promotion is the name of the game. I found the book an enlightening and thought provoking read which was difficult to put down. It is both a fascinating insight about how individuals in the elite saw recent history, but also a provocative interpretation of how our idea of the Establishment may no longer be valid. When two of my favourite commentators on current political events, Ian Dunt (ID) and Owen Jones (OJ), cross swords, albeit briefly twitter style, the chance is that there maybe something interesting going on. I can see what I suspect annoyed OJ in ID’s piece, but I think OJ’s response was too easily sidetracked in the confusion that is history. I am going to stay on more familiar UK (and US) ground. I say “almost” because this is an undifferentiated list, and the emphasis is put on what I regard as least important. For Müller populism is a moralised form of antipluralism. The populist politician talks about the “will of the people” even when the people may be just a subset of the population, but the wishes and beliefs of the remainder are of no weight and are not acknowledged. They become instead the enemy within. To overcome that enemy within (be it Jews or Muslims or liberals) and the enemy outside (the EU trying to force Hungarians to accept immigrants), the leader needs total control, which means subjugating an independent judiciary, an independent press and other independent institutions. For Müller, populism is an attack on pluralistic democracy, attempting to replace it with some kind of autocratic or plutocratic democracy. Orban’s Hungary has so far been a very successful (in terms of longevity) example of this form of populism. Where I started to disagree with ID’s piece is where he tries to do the classic centrist thing, which is to imply that the dangers of populism in the UK come from both left and right. In immediate historical terms this is nonsense. Immigration as an issue was revitalised by the Conservative opposition and the right wing press in the early years of the Labour government. In 2001 William Hague talked about Tony Blair wanting to turn the UK into a ‘foreign land’. The right wing papers started producing negative stories about immigrants, long after the rise in non-EU immigration in the late 1990s and long before the rise in EU immigration from 2004, and popular concern about immigration rose with this increase in press coverage. The best explanatory variables in explaining concern about immigration were readership of the Mail, Express and Sun, in that order. All three were better predictors of concern about immigration than whether people voted Conservative. When the Conservatives became part of the coalition government in 2010, this emphasis on immigration became official policy. By now the idea that immigration was ‘a problem’ that needed to ‘be controlled’ was firmly entrenched in political discourse. Conservatives found it attractive because it could persuade socially conservative left wing voters not to vote Labour, and because it became a useful scapegoat for the effects of austerity. The right wing tabloids also found it attractive because it became a means of winning the Brexit vote. And it is Brexit where we have seen populism in full force in the UK: talk of the ‘will of the people’ as if the 48% who voted Remain did not exist, attacks on the judiciary, on the civil service, on parliament and on universities. The EU is the enemy without, and Remainers are the enemy within. Much the same point can be made about the US. Trump was voted into office as a Republican, and he remains unchecked in office because of the Republican party. To suggest that Republicans and Democrats bear equal responsibility for Trump is just nonsense. In this story of how populism came to the UK, and represents an ever present threat in the UK, Labour’s problems over antisemitism do not even deserve a footnote. Antisemitism is a big part of Orban’s campaign and rhetoric, personified in his constant attacks on George Soros, but that theme has been repeated not by Corbyn but by the same right wing press that focused on immigration and gave us Brexit. Antisemtism is a problem within Labour, but the source of that problem is the Israel Palestine situation. It is not, and never will be, a part of a Labour government’s appeal to the electorate. It will not be a Labour government that tells people that have lived here for scores of years that they now have to leave the UK and say goodbye to their friends and family. It is not and never will be the Labour party that runs an Islamophobic campaign for mayor of London. In Europe and the US, the threat today of an authoritarian, anti-pluralist government comes exclusively from the right. To lose sight of that makes dealing with that threat much more difficult. There are plenty of centrist Remainers who insist Brexit is as much Corbyn’s fault as it is the government’s. Apparently the fact that Corbyn campaigned for Remain does not count because he didn’t put enough energy and passion into that campaign. When he says he would vote Remain again he must be lying because no one ever changes their mind. Accusing Corbyn of being too ready to accept the referendum result is fine by me, but to put him in the same class as Johnson and Gove is just token centrism. The Brexit project is already a complete failure. That statement may seem odd, as we are less than one year away from leaving the EU. But what happens in March 2019 if all goes to plan? We leave the EU, but remain in the Single Market (SM) and Customs Union (CU). It is not Brexit means Brexit, but Brexit in name only (BINO). All the UK ‘gains’ is the inability to influence the rules and laws we have to follow as part of the SM & CU. If the Brexiters were being honest, the transition is worse than not leaving. Not only do we lose the sovereignty they perceive as a result of being in the SM & CU, but we also lose our current say in how the SM & CU are run, and we still pay into the EU budget. In sovereignty terms that is going backwards. Free movement continues, although again if Brexiters were being honest they were never too worried about immigration: that was just a hook to catch voters with. But all the things that Brexiters do go on about like freedom to make trade agreements with other countries are impossible during transition. Brexiters may well convince themselves that transition is just an embarrassing phase before their new dawn. They can only do that because they have never concerned themselves with details, whether those are details about how trade works or details about negotiations. The reality is very different. There is no solution to the Irish border problem except staying in the Customs Union and Single Market for goods. Will the EU be prepared to accept the ‘Jersey option’, which means splitting the Single Market (UK in for goods and out for services) and allowing an end of free movement? That may appear to others as if the UK might be better off after Brexit, which breaks one of the key EU requirements of any deal. As we have learnt from the last year, if the EU does not want something it does not happen. Leaving with No Deal is no longer a threat, so it may be quite possible that the EU may simply say the only feasible solution, if the UK does not want a border in the Irish Sea, is to stay in the complete Single Market and Customs Union. With a hard deadline for the end of transition leaving little room for negotiation, the UK may have little choice but to agree to BINO, or something very close to it. The alternative is that the EU creates an extended transition. But if they are unwilling to allow the UK what it wants, this amounts to the same thing. The only cost to the EU of perpetual transition is pretending to negotiate. The UK government will continue the pretense because it is too embarrassing to admit defeat. The result for the Brexiters is the same: staying in the CU and SM with no say. If you think that could not happen without a revolution on the Conservative right, watch how Gove and Johnson are already backing down on all their past red lines. Will not voter pressure (aka. the right wing press) demand that May cannot agree to continuing free movement? By 2020, when the final deal will be negotiated or postponed, immigration from the EU may have almost disappeared as a result of slow growth in the UK, sterling remaining weak against the Euro, and continuing uncertainty about the final deal. Net EU immigration is already less than half non-EU immigration. It is no surprise that the Brexit project has failed and failed so utterly and completely. It was based on a fantasy about UK power. According to this fantasy the EU would be desperate to let the UK continue to trade with the EU on current terms and would turn a blind eye when the UK no longer obeyed the rules of the Single Market and Customs Union. The reality is that the EU has not been willing to destroy the Single Market and Customs Union just to keep exporting to the UK. The moment it became clear to Brexiters that their fantasy was just that, the only way that they could gain the sovereignty they craved and promised was to leave with no trade deal. But that idea was also based on the fantasy that trade with the EU could be easily replaced with trade agreements with other countries. Nearly every expert said at the time these ideas were nonsense, and nonsense they remain. No government would ever knowingly do so much damage to its economy. The moment the government’s own analysis confirmed what outside experts had said before the referendum, No Deal was off the table. Mr. Fox will still have a job: not making new deals but trying to convince the many countries that currently have trade agreements with the EU that they should still trade on the same terms with the UK after we leave. As I write the paragraph above there is a part of me that says surely no one could have been that foolish to believe those things. Surely there must have been more behind the accusation of Project Fear, and the fact that over 40% still believe they will be better off after Brexit happens. But in truth there was nothing more profound. Look at the desperation of Brexiters over the Irish border, claiming that none is needed when they originally campaigned to take back control of our borders. Of course none of this will prevent the Brexiters celebrating their independence day in March 2019. They love the symbolism, and they will do a good job in persuading the BBC that something has been achieved. They have too much political capital in Brexit being a success. Key Brexiters will prefer to party rather than complain, particularly when there is still the prize of the party leadership to win. But the reality is that in March 2019 we become what Rees Mogg calls a vassal state in the short term for sure, and probably in the longer term as well. There has been some debate recently among those who understand what is going on about whether Remainers should give up trying to prevent March 2019 happening and focus on getting the best Brexit terms. It is, as Ian Dunt says, a false dichotomy: there is no conflict in doing both. But if there is an exception to that, it lies with the Conservative rebel MPs. If they can see that Brexit will end not with a bang but a whimper, they may well decide that it is not worth being branded traitors by voting against the withdrawal agreement. That, not Corbyn, is the most likely reason why March 2019 will happen. Of course there are mistakes the government can make before March 2019. But if Brexit happens, it will not even be a token victory for the Brexiters. For them, BINO or something close to it is worse than EU membership, because we gain nothing and lose a seat at the table. Their fantasy dream of Global Britain has in reality made Britain more insular, more powerless and less influential than at any time in centuries. Nor is there anything to celebrate for Remainers here. Economic damage has already been done, and will continue to be done because BINO is a more uncertain state than EU membership and because of less EU immigration. Years of the UK’s political life will have been spent finding out that the scheme of a small number of politicians and press barons was the folly experts said it would be, and then pretending it was not.